In Constant Guests, debut novelist Patricia Nedelea spins a tale that skips across the European continent and the centuries, interweaving art, Christology, parentage, romance and intrigue. The story centers around Isa, a 24-year-old Parisian waitress whose world rips apart once she discovers that she’d been adopted at birth, and that Mara, her biological mother, has just died after being comatose for 20 years. Shocked, Isa springs into action, determined to learn about her parents—and maybe herself as well. Isa subsequently realizes that her beloved small painting, one she’d had since infancy, previously belonged to Mara. It’s revealed that this painting is a sample tarot card, the prototype of the original 24-card set, created in 1389. Since Mara had been intent on finding the entire set, Isa attempts to reconstruct Mara’s journey in order to understand the mother she never knew. Like the novel Cloud Atlas, the story moves forward and backward in time, entailing different characters and scenarios. From a spiritual teacher in Patmos, c.100; to a faux-bishop in Tuscany, 1389; to Mara, a onetime timid museum curator in Transylvania, 1971; to present time, Nedelea effortlessly spins the disparate threads into a collective whole. Nedelea’s descriptive skill is impressive (one character, for example, is “a short unremarkable blonde with a face like a seal’s.”) Her locales paint a perfect sense of place, with pinpoint specificity of sights, sounds and even smells. And her literary tour of medieval torture devices? Explicit—-and chilling. Constant Guests is not without issues. Although Nedelea’s knowledge of tarot cards is prodigious, the resulting minutia impedes the story’s momentum; furthermore, frequent reportage of who owns which of the 24 cards (continually in flux), muddies the plot. And the book’s final portion delivers such an overload of farfetched information, most will have to re-read to absorb it. That said, the author’s craft and creativity (plus the glorious tarot card illustrations) are superb. 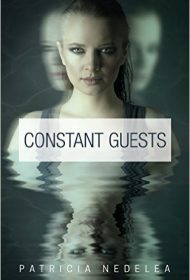 Despite its flaws, Constant Guests is an engaging, notable debut.